This has to be one of the most beautiful lake scenes I've set eyes on in America. This is Vermont, home of cows, cheese, maple syrup, the Von Trapp family and Bernie Sanders. Remember Alistair Cooke's Letter from America? And how often his relaxed and hypnotic tone would eulogise Vermont, the quintessential rural paradise? Exquisitely pretty it is too - I get the feeling that the cows in Vermont are cleaner than the muddy ones in western New York. They're probably house-trained and take showers before they go out into the fields. Solar-powered showers, of course, as Vermont is very green - in every sense. 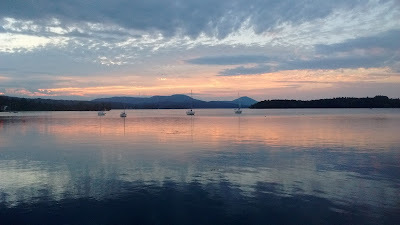 Vermont is not quite the fairytale, particularly where economics are concerned but never mind about that now, it's the summer holidays and hubby and I have been there for a wedding, followed by a short trip to lands beyond on which more later. Meanwhile, the above lake must be a contender for the most unpronounceable lake in the western hemisphere. 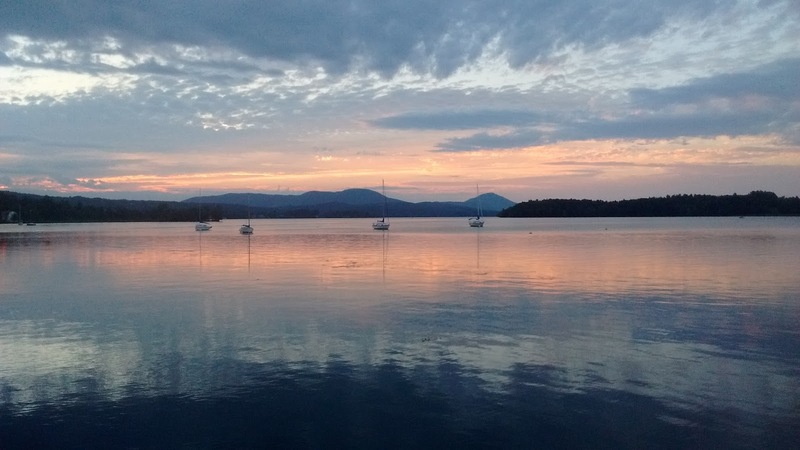 It glories in the name of Lake Memphremagog and the Canadian border runs right through it, so you need your passport if you go boating.